There are over 500 types of bacteria and yeast that live inside of our guts alone! Not to mention that every single surface of the planet is covered in bacteria - from the smell of the rain to assisting plants with uptaking nutrition at the roots - bacteria are intimately involved in every aspect of life in our galaxy! Why do we call ourselves "Bacteria Powered"? Bacteria live all over our bodies - both inside & out. Bacteria make up over 90% of the cells in your body - we are only 10% human cells! Bacteria break down the food in our gut, create vitamins, help us absorb nutrition from our food and keep our immune system strong. Kombucha, kvass, kefir, jun, kraut, kimchi, salami, wine, beer and more are all bacteria rich foods that keep our bodies in balance and running the way mother (bacteria) nature intended. 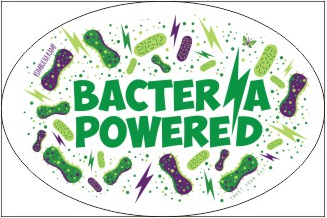 Show your love for all things bacteria with this glossy sticker. The perfect gift for fermentation fans, bacteriologists and all bacteriosapiens in your life.